Also serving communities of La Pine. The average cost of assisted living in Bend is $3,045 per month. This is lower than the national median of $3,346. To help you with your search, browse the 33 reviews below for assisted living facilities in Bend. On average, consumers rate assisted living in Bend 4.1 out of 5 stars. Caring.com has helped thousands of families find high-quality senior care. 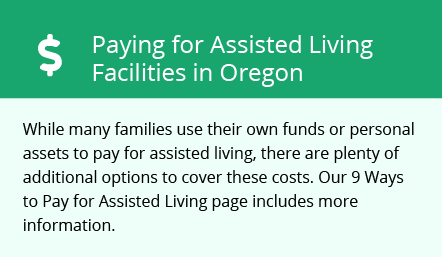 To speak with one of our Family Advisors about assisted living options and costs in Bend, call (855) 863-8283. Bend, Oregon is a small resort city located on the eastern edge of the Cascade mountain range, along the Deschutes River. The city has a population of more than 94,000 residents, 16 percent of whom are aged 65 and older, and may need help with daily living tasks. There are nine assisted living communities available locally to serve this demographic, with an additional two options in the nearby community of Redmond. In the city of Bend, and throughout the state of Oregon, these facilities are managed and licensed by the Oregon Department of Human Services. The warm and sunny weather in Bend makes it a great choice for seniors. Winter temperatures don't fall below the mid-20s, and summer highs reach around 82 degrees. In fact, the city scores a 69 out of 100 in terms of overall comfort. Bend has only one facility, St. Charles Hospital, in the event of an emergency or illness, with the nearest major hospital located in Portland. Bend has an array of community resources for seniors, including the Making Oregon Vital for Elders (MOVE) program, an organization involved in encouraging the Oregon community to value its elders, as well as a number of programs and activities organized by the Bend Senior Center. To help seniors get around the city, the Cascade East Transit offers a fixed-route transportation service with discounted fare rates. Additionally, Ride Assist, also known as Bend Dial-a-Ride, provides curb-to-curb transit services to disabled individuals and seniors in the Bend area. The overall cost of living in Bend is higher than many other cities in Oregon. Based on the U.S. national average of 100, the city scores 134.1, largely due to high housing costs, which are more than double the national average. The rate of violent crime in Bend scores 12.2 on a scale of 100, with 100 considered high crime, which may offer seniors peace of mind. However, property crime is much higher, receiving an overall rating of 37.2. Assisted Living costs in Bend start around $3,045 per month on average, while the nationwide average cost of assisted living is $4,000 per month, according to the latest figures from Genworth’s Cost of Care Survey. It’s important to note that assisted living rates in Bend and the surrounding suburbs can vary widely based on factors such as location, the level of care needed, apartment size and the types of amenities offered at each community. In Oregon, two government programs can provide financing for seniors staying in assisted living communities. These include the Oregon Health Plan, which is part of Oregon's Medicaid program, and the Community First Choice Option. Bend and the surrounding area are home to numerous government agencies and non-profit organizations offering help for seniors searching for or currently residing in an assisted living community. These organizations can also provide assistance in a number of other eldercare services such as geriatric care management, elder law advice, estate planning, finding home care and health and wellness programs. To see a list of free assisted living resources in Bend, please visit our Assisted Living in Oregon page. Bend-area assisted living communities must adhere to the comprehensive set of state laws and regulations that all assisted living communities in Oregon are required to follow. Visit our Assisted Living in Oregon page for more information about these laws.